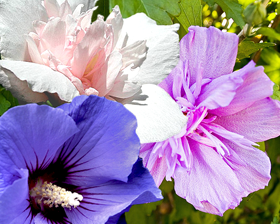 Strikingly beautiful 15 cm variety colors flowers grab attention from across the garden. Plants, with nicely contrasting deep green, lobed leaves, reach a statuesque height of 3-4m. It loves the heat of summer and prefers full sun to partial shade and moist to wet soil conditions.